... When you can Make McDonald's Sweet Iced Tea at Home! Yes, I know ... I can hear you now: "Dude --! It's the middle of winter! 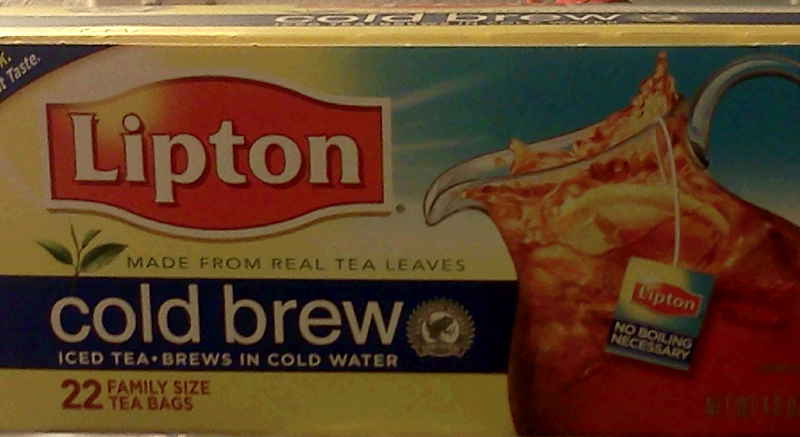 Why would I want to make iced tea *NOW?!? *"
That's an easy answer: "Because you can!" Besides ... I just made myself a batch of my Cheap and Sleazy Chili, and I think it might be a bit hotter than I intended, so iced tea is a must! Not to mention the fact that I said I would let you know when I figured it out, and I have! So sit back, relax, and take some notes for your next grocery shopping expedition! Yes, that's right ... I figured it out. I'm talking about how to make McDonald's Sweet Iced Tea at home ("in your SPARE TIME!" like those ads used to say back in the day). Unfortunately, you're going to have to do a little shopping ... and at this time of year (it's February 3rd, 2014 as I write this), one of those items might be difficult to find! If you like lemon in your tea, feel free to add that to your list! "What if I Can't Find That Particular Brand?" Well, you might find a generic version that should do the trick; just make a note of how it tastes to you, so when you finally buy the brand I recommended here, you'll be able to tell if there really is a difference between the two. The directions are actually on each of the bags, but I don't exactly follow those instructions. What I do instead is brew my tea in a special vessel ... one designed specifically for that purpose! "Um, Isn't That Just a Couple of Cups From McDonald's?" Why, yes! Yes, they are! Yeah, sure, I could use that garish pitcher I picked up at one of the local stores, but I didn't like doing it that way when I tried it that one time, so I fell back on to this method I'm going to describe for you here. If you look at the back of one of the tea bags, you'll see the directions talk about how to brew two quarts of tea. 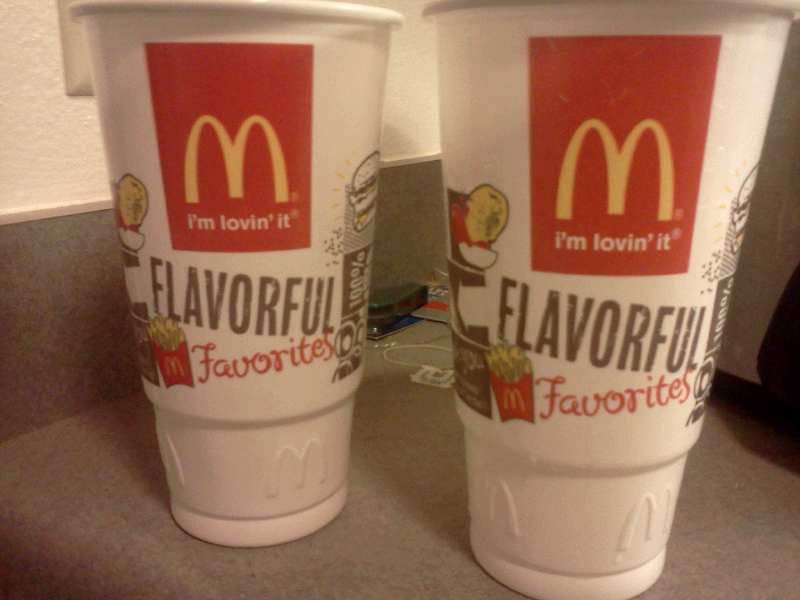 Well, it turns out that the cups -- er, "special vessels" -- are one quart (four cups) each, so I just brew it in the McDonald's cups. You're going to need two measuring cups -- the one cup, and the quarter cup. Pour three quarter cups of sugar into both of the "Special Vessels." Add one cup of hot water to both of the vessels. Stir up both vessels to desolve the sugar. Once the sugar is sufficiently dissolved, add two more cups of hot water. I'm sure you've noticed we're short by one cup of water in each of the "special vessels," right? That's because the sugar is taking up that room, but not to worry; I have a plan for that! Next, drop two tea bags into each of the "special vessels." Cover them with the lids they came with (um, you *DID* keep the lids, right? If not, improvise, adapt, and overcome and come up with a good substitute! ), and go do something else for a while; at least for an hour. When you get back from wherever it was you decided to go, open the "special vessels" and stir until the water and tea are well mixed -- that is, all you see in the cup is dark tea, vice the clear water/brown water mixture you should have seen when you opened the "special vessels." Next, pour one cup from each vessel into whatever you're using in place of my wine iced tea jug. Next, add another cup of water to each of the vessels, and replace the lids. If you like, you can go back to doing whatever it was you were doing the last time ... but this time, you can stay as long as you like! When you get back, open the lids and stir up both of the mixtures, then pour them into the same wine tea jug you poured the other cups into (fair warning! If you live with somebody else, they will most likely have "sampled" that tea, so don't be surprised if your wine tea jug is either empty or close enough to it that it doesn't matter! ), and serve with ice. Hopefully, your mixture tastes just like what you can buy at your friendly neighborhood McDonald's. "Hold on there, fella. Last time out, you were talking about Stevia and Agave Nectar. Can you make this stuff with those?" I haven't tried making this recipe with Agave Nectar as yet; but I'm brewing a batch with Stevia right now! One thing that's different with this variation of the recipe is you will only need half a teaspoon of Stevia for each of the "special vessels." This one change also shortens the recipe by removing that bit about pouring some of the tea into the wine tea jug so you can add more water to the "special vessels." Instead, you just add the Stevia to the first cup of water, stir it up, then fill the rest of the "special vessel" with more water, toss in the tea bag, and go away for a while. I think that aftertaste was from the tea itself; I guess I didn't stir it properly or something, or perhaps I should have let the tea steep for a while longer. Normally I make this stuff in the afternoon when I start making my chili, and when the chili is done, so is the tea ... and if you haven't read that Cheap and Sleazy Chili recipe, that means the tea steeps for about six hours. Some time after I wrote this article (~03FEB14), I found some liquid stevia at my friendly neighborhood Trader Joe's. Unfortunately, I had some serious trouble with finding a conversion table at the time, so the bottle sat in my kitchen cabinet, mocking me with its inscrutable ... um, smile. Fortunately, I ran into Dr. Robin Falkov, one of my Facebook friends on (you guessed it ...) Facebook. Robin is a naturopath (and yes, Google is your friend if you don't know what a "naturopath" is), and is pretty much responsible for keeping one of my favorite Coast to Coast AM guests alive when he -- well. Let's not dwell on that one; suffice to say he's alive, and has Dr. Falkov to thank for the past ~ten years or so. Anyway, the good doctor linked to a recipe for a nice looking dessert, and said she would use stevia instead of sugar ... which prompted Yours Truly to ask her about my lack of a conversion table for the liquid stevia I bought all those months ago. 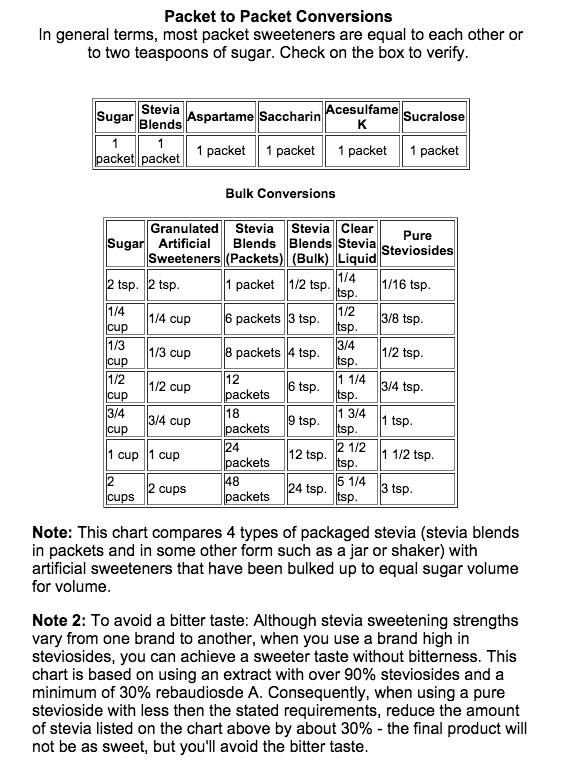 You probably recall that each of the "special vessels" needed 3/4 cups of sugar, so checking to see how much liquid stevia that is on the chart up there comes out to 1 3/4 teaspoons of the liquid stevia. 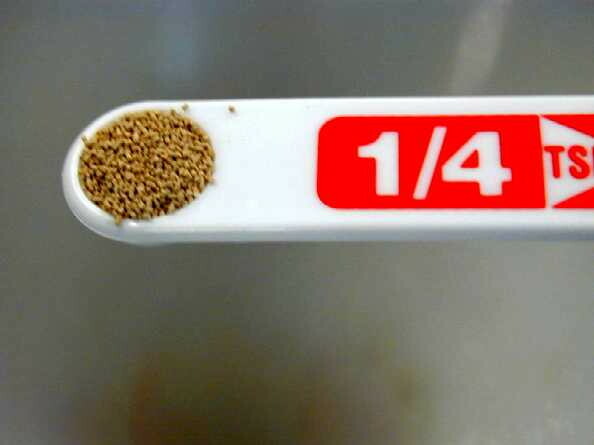 If your cooking skills rival mine -- which isn't that difficult --, you're probably thinking, "How in the frell do I figure out how much one quarter of a teaspoon is?!?" That's easy ...! You cheat. ... and you do that by using your 1/4 teaspoon three times. "I've been hearing about this stuff called Truvia. What's the difference between that and Stevia?" 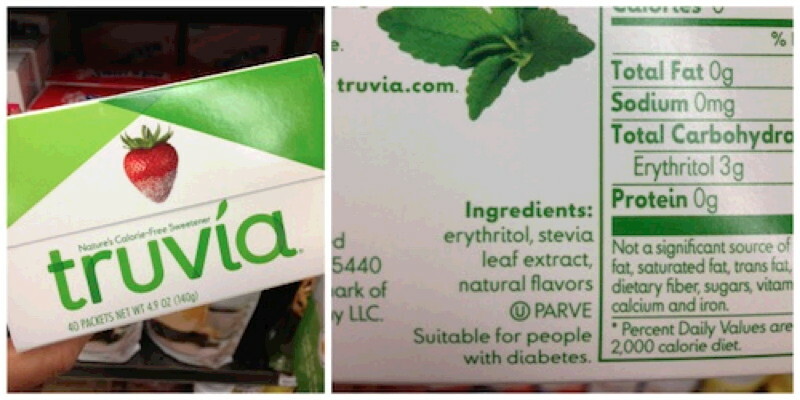 In contrast, take a look at the Truvia lable here, which I borrowed from an article by "Food Babe:"
If you want to know more, feel free to Google those "extra" ingredients sometime. Or better yet, just read that article. Vani "Food Babe" Hari does a good job explaining what's what with those extras. 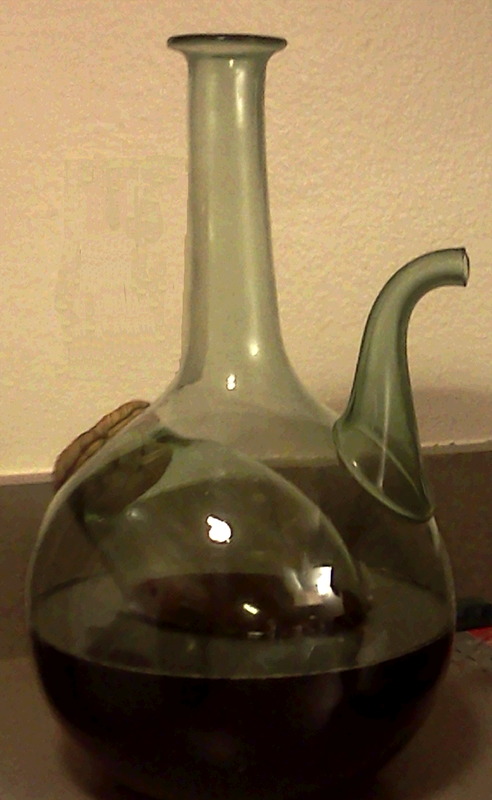 Okay, so it is really a wine jug. While looking around a second-hand store for a few books to add to my already massive bunch of collection of books, my "roomie-in-law" pointed out that wine jug, and said, "Ooh, this is nice! It would be great for your iced tea!" At the time I bought it, it had a "cork" made out of straw or something like that in the top, as well as the one in the side -- which is where you're supposed to put ice to keep the wine inside cool. Well, that "cork" pretty much fell apart within a few weeks, and I have yet to find a replacement ... so I just used it without it for a while -- until I noticed that my refrigerated tea tasted just a bit too much like the salmon I had cooked the night before. That's when I came up with a high-tech addition: a small plastic bag and a rubber band. Of course, I had to put a hole in the bag so I could pour the tea out of the jug, but other than that, the bag keeps those food odors out, and the tea flavor in! Unfortunately, I find that the jug is hard to wash. If I leave the tea in there too long, the bottom stains. I can't stick anything in there to get that out, and putting it in the dishwasher doesn't help much, because the water still has to get past that ice compartment. So I just pour a bit of liquid soap in it and then run some hot water in it when I'm done using it, and let it soak for a while. It's not perfect, of course, but it gets the job done! 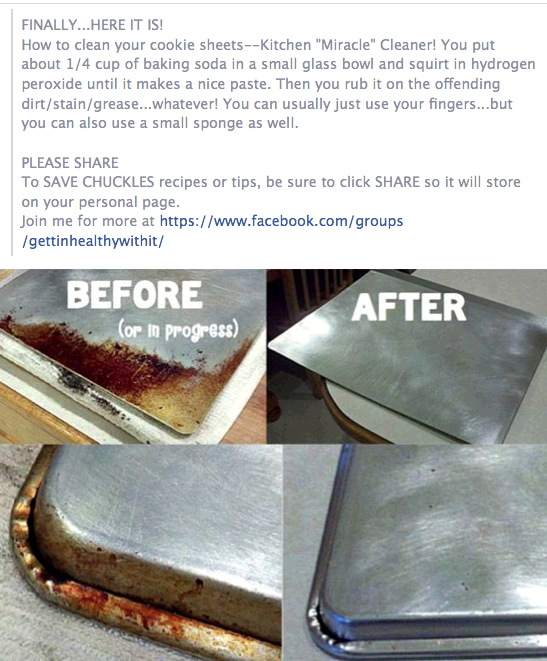 What the article basically says is to mix some hydrogen peroxide and baking soda and make a sort of paste, and apply that paste to your stubborn stain of choice. Naturally, I couldn't do that with this wine jug, but experimenting with the Stevia version of this recipe, I decided to pour half a teaspoon of baking soda into the jug, followed by a couple of teaspoons of hydrogen peroxide, and swished it around a bit, then let it sit for about an hour or so (well, okay, so I was working on something else at the time!). When I went back to check on it, I picked it up and swirled it around, and the stain was gone!